Grand Living residence is an ideal place for travelers, professional displaced and students seeking for a comfort and convenience room in Chiang Mai. Grand Living residence is an ideal place for travelers, professional displaced and students seeking for a comfort and convenience room in Chiang Mai. The city center is merely 4.2 km away and the airport can be reached within 13 minutes. A haven of rest and relaxation, the hotel will offer total renewal just steps away from the city’s numerous attractions such as Maya Lifestyle Shopping Center, Nimmanhemin road, Think Park and Doi Suthep. Grand Living Residence offers impeccable service and all the essential amenities to invigorate travelers. To name a few of the hotel’s facilities, there are family room, elevator, Wi-Fi in public areas, car park. The building features 180 beautifully appointed guest rooms, many of which include shower, mosquito net, internet access – wireless (charges apply), television LCD/plasma screen, and telephone. Besides, the hotel’s host of recreational offerings ensures you have plenty to do during your stay. Whatever your purpose of visit, Grand Living Residence is an excellent choice for your stay in Chiang Mai. Our selection ranges from different types of one and two bedroom apartments. The apartments can be occupied from 1 night to 6 months or more, giving the corporate or leisure traveler the flexibility of rates in line with length of stay. Our Superior rooms are individually designed to provide a home from home experience with. Each comprise built-in furniture and en-suite bathroom. There is table and chairs for working and dining. Our superior room provide a comfortable and economical option for corporate and leisure travelers alike. Our Deluxe rooms offer increased space. They keep all the features of our superior, however benefit from a separate lounge with a sofa and increased storage space. Many contain a separate toilet as well. They are suitable for 2 people. Our two bedroom apartments are available with double and single bedrooms or double and twin bedrooms, making it ideal for families or friends. 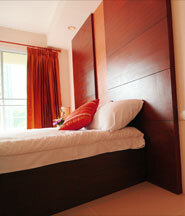 Each comprise built-in furniture and en-suite bathrooms. They also benefit from increased lounge and storage space and are suitable for 4 people.